The Poem, It's Power Never Ends, A Poem about the Source, is on page 10 of my Book of Poems, Beyond These Dark Lands Are Edges of Joy, Words of Comfort and Hope. This is a poem of rational hope, a hope that is founded on an intelligent belief in God's active mercy in our lives. It is my vision that this poem will inspire others to a deeper hope in God during their difficult times. I wanted the title to grab the reader's attention immediately. It makes you wonder what the "It" is, and what the "Power" is. The subtitle, A Poem about the Source, is to deepen the reader's curiosity. You assume that this fundamental something that is powerful eternally. This poem is 29 lines long and forms eight sentences. The overall tone is direct like a 98-word sermon. I did not use metaphor and imagery. The lines are short, some have only one or two words. Most lines are four five or six syllables with very few rhythms. There are two halves; the first half makes a statement and the second half expands the statement. This poem makes its point early in line five that the poem is about hope. Who your hope is in." It points out that we should not blindly hope in hope, but we must hope in God who is not only able to meet all of our needs for deliverance He is divinely worthy of our faith. Lines 12 through 14 points out that we must clearly define who or what our hope is in. The poem ends like a Psalm where God is declared worthy of our hope. 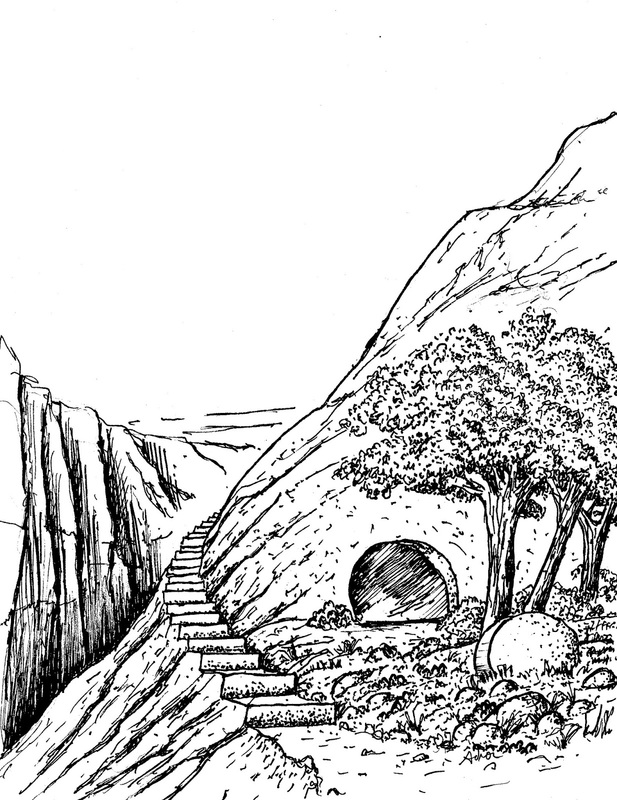 Most of the book's illustrations have a road going through the dark lands. 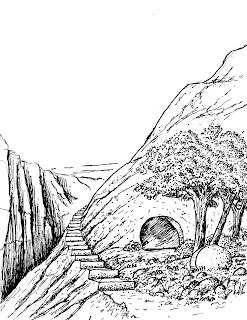 In this illustration, the road winds around a hill with an empty tomb representing lines 20-21. This poem is a valuable statement that we can have hope. Reading it will strengthen those who need reassurance that God is worthy of their hope. You can read this poem on page 10 of the book. If you would like to read a sample poem choose the link below for the website. For digital downloads CLICK HERE., $2.99.